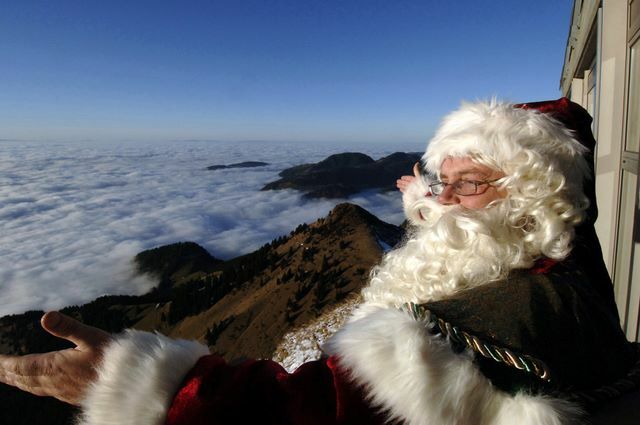 Each December children can visit Father Christmas by cog-wheel mountain train at his Swiss home on Rochers-de-Naye, an Alpine peak towering over Montreux and Lac Léman. Visiting Santa’s house at the top of Rochers-de-Naye is one of main attractions for children to the annual Marché de Noël à Montreux on Lake Geneva in Switzerland. The Christmas market on the lakeside quays in Montreux is the largest and best Weihnachtsmarkt in French-speaking Switzerland but a cog-wheel train trip up the mountain to see Santa at his Swiss home adds a magical element with snow guaranteed. The House of Father Christmas (La Maison du Père Noël aux Rochers de Naye) opens each year during the Montreux advent Christmas market festival period. Rochers-de-Naye Alpine station is at an altitude of 2032 m and offers marvelous views of Lake Geneva, the Alps, and Montreux. During summer, Rocher de Naye is best known for its marmot park and hiking trails but during advent, Santa Claus is the main attraction for most children. Adults will enjoy the fantastic views year round with snow guaranteed in December. Santa can be visited from November 24 to December 24, 2012, but not on Monday or Tuesday. Santa’s House at Rochers-de-Naye is open during the same period as the Marché de Noël à Montreux (Christmas market). In contrast to the Weihnachtsmarkt at lake level, Santa usually takes Mondays and Tuesdays off and may have something else to do on the evening of December 24. In addition to photos with Santa, young visitors can enjoy further Christmas related events that changes annually. Restaurant facilities are available and it is even possible to sleep over in a basic hostel or Mongolian yurt. (Reservations via MOB Goldenpass). Return fares for adults are CHF32 and CHF19 for children (6-16). No further discounts or passes apply. Trains depart Montreux hourly from 9:17 am to 3:47 pm and Rochers-de-Naye from 11:46 am to 5:46 pm. Santa’s home at Rochers-de-Naye can only be reached by cog-wheel train. The train takes just less than an hour from Montreux. It is a magical journey with the train passing through many tunnels and crossing several bridges with wonderful views. During the journey, the mountain train climbs around 1,600 m from Lake Geneva to the top of the Alps. The train departs generally once per hour between around 10 am and 6 pm from Montreux and two hours later from Rochers-de-Naye. Seat reservations are essential – if space allows, up to minutes before departure but on weekends it may be necessary to book weeks in advance. The Marché de Noël à Montreux is by far the best and largest Christmas market in the Lake Geneva region in Western Switzerland. Other large Christmas markets in the Lac Léman region are in Lausanne and Geneva but these pale in comparison to the Marché de Noël à Montreux.